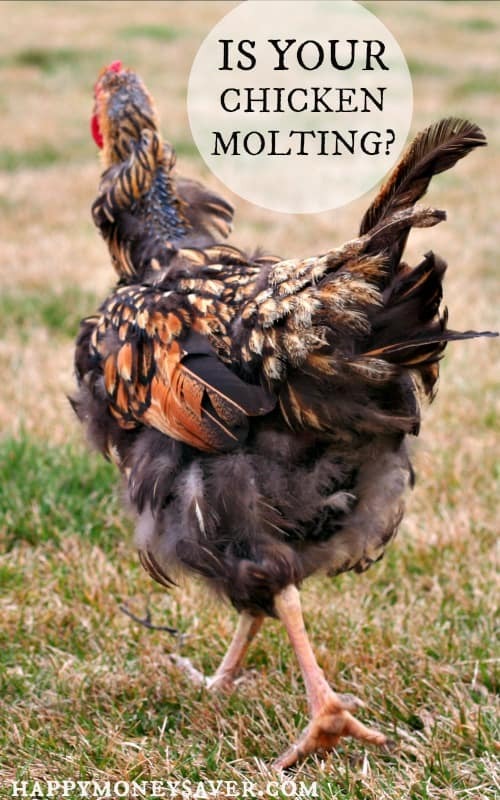 Have you heard of a chicken molting? 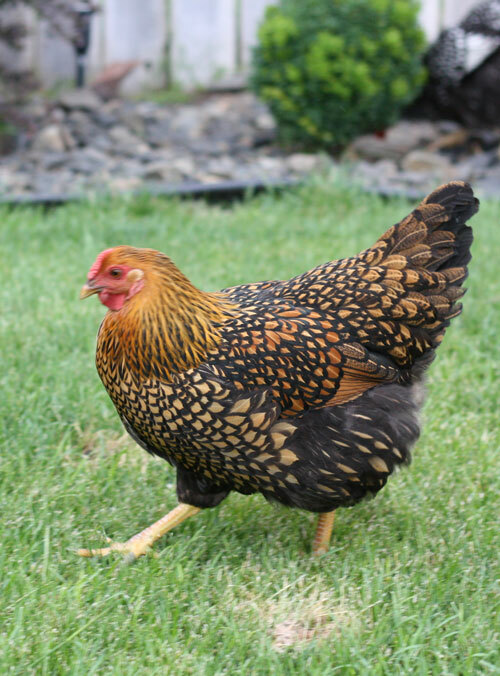 Well, it’s happening right now to Miss Goldie, my Golden Laced Wyandotte chicken. Last week I noticed the chicken coop started to look like someone had a massive pillow fight in there. Feathers were all over the place! Miss Goldie was the one who started losing all her feathers. And I laughed hard when I first saw her all patchy and scraggly looking. What is chicken molting you ask? Well, once every year chickens will lose all their feathers as new ones grow in. 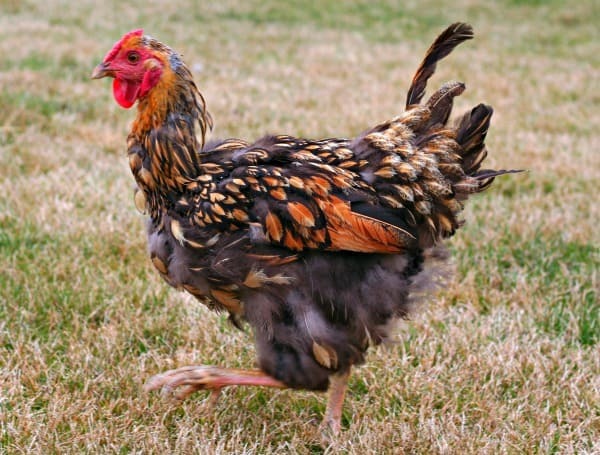 Usually chicken molting occurs naturally in fall or winter in a response to the shortening of days/getting darker. 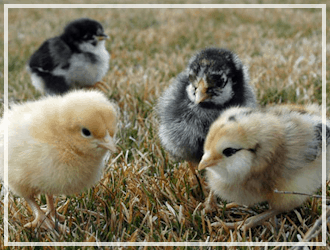 There are other reasons why a chicken molts such as if they don’t get food, they are sick, or just stressed. 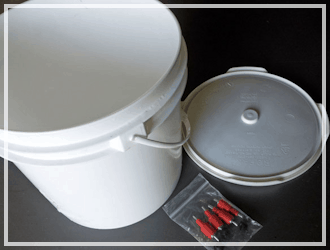 This process of chicken molting can take between 2-6 months depending on your chicken. 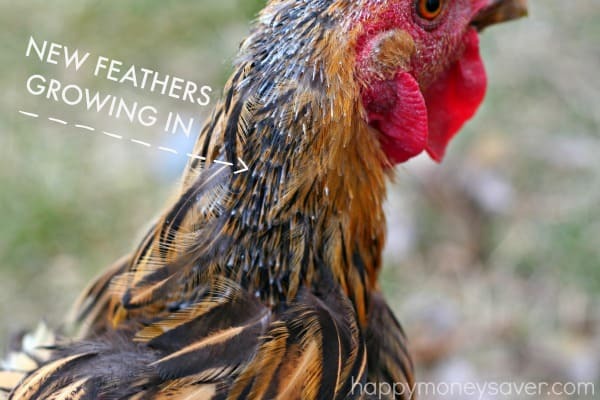 When you have a chicken molting the first feathers to go usually are the head feathers. Then goes the neck, then breast, body, wing, and lastly tail. You will notice as they lose feathers new little shafts will grow in. These are the new feathers! 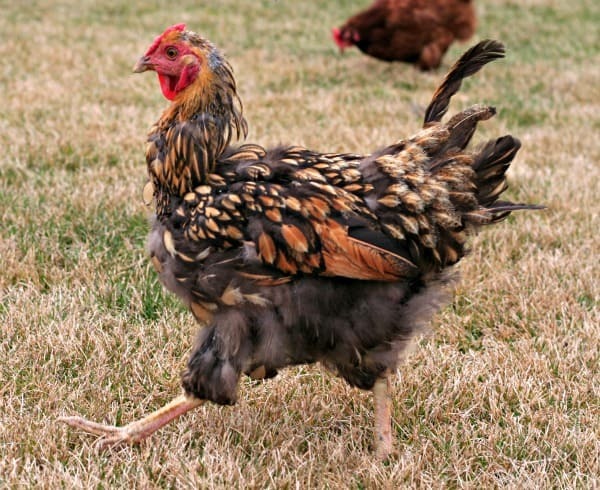 Yes, your poor molting chicken will look ugly, but that’s not even the worst part. 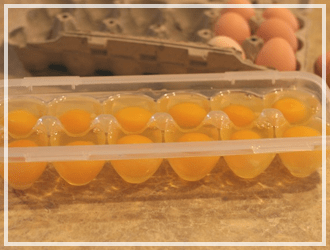 They stop laying or significantly drop the amount of eggs they lay when they are molting until the molting is completed. Boo! Boo I say! That means for me that Miss Goldie won’t be laying much for the next few months. 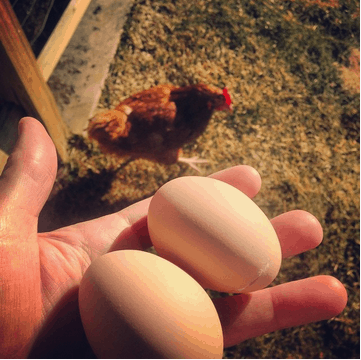 I will be missing her fresh eggs. I am looking forward to Miss Goldie’s beautiful shiny new feathers coming in though. After being out in the sun last summer all her feathers got faded by the sun which was a bummer because she is probably my prettiest chicken. I can’t wait to see her in all her glory again. Here is Miss Goldie before…. My other girls? They are doing well. Still laying eggs. I think a few of them have done some partial molting, but none has changed as much as Miss Goldie. Shake them tail feathers girls! Thanks for reading all about my chicken molting. 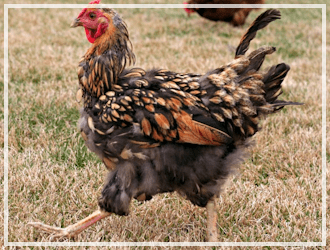 Do your chickens molt every year and if so what time of year? I live in Las Vegas and every year my girls molt with the on set of the heat and many of they stop laying. My Americana’s (3) and my Star are the worst for looks. 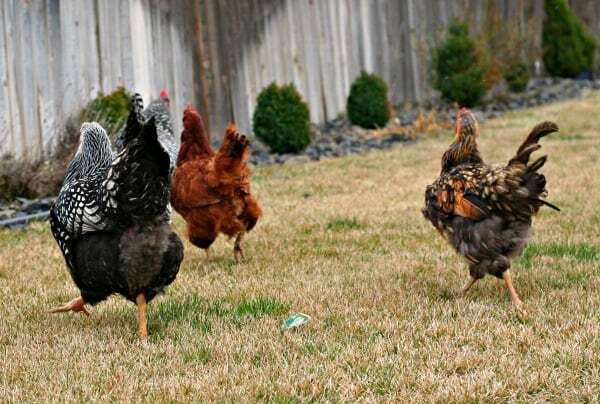 They could very well be stressed, or sometimes due to weather my chickens all started molting at the same time. Poor babies! question. 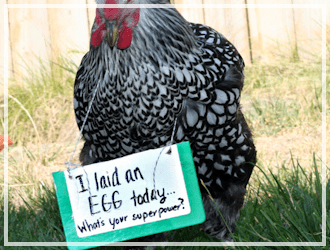 what does your coop look like for your chicks? 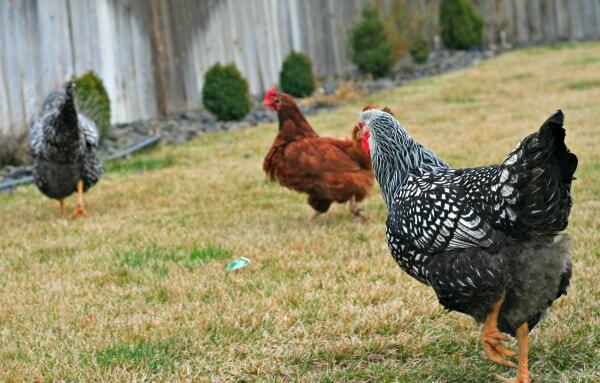 also does your chicks free to roam in your backyard? in the photo it looked like it. Here is my chicken coop! https://happymoneysaver.com/my-pretty-little-chicken-coop-with-the-white-picket-fence/ I love it! 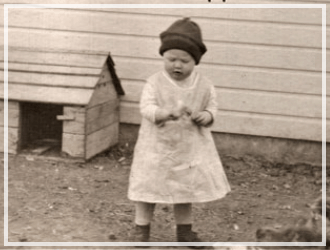 I understand wanting chickens and hopefully someday it can be a reality for you, too. Here is the beginning of my chicken journey. It has definitely been worth it for me and my family–we just love them! Our barred Plymouth, Patty, just finished molting. She was a sad sight to behold for awhile there. Our friends asked if we needed to butcher her she was so homely and sick looking. She’s back in all her glory and laying on schedule again though. Our blue cochin, Shadow, lost a ton of feathers but we never noticed significant molting – she’s so fluffy I think maybe it wasn’t as noticeable. Annie, the Amercuana seems to have skipped molting altogether. 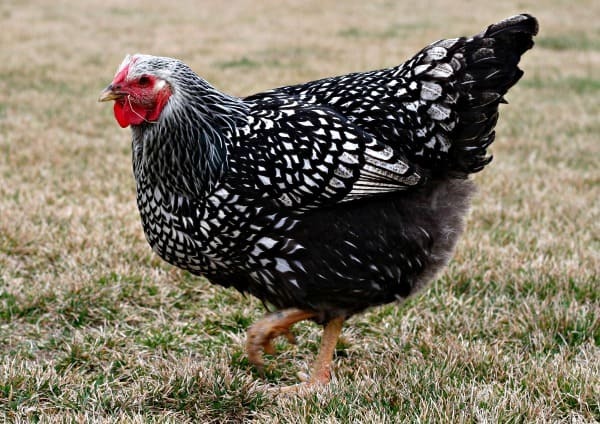 I’ve always wanted a blue cochin, they look so pretty. I know what you mean about some chickens molting and sometimes never noticing the change. I think Pepper our barred rock molted, but I didn’t see it happen because it must have happened so slowly or something too.